There where some issues necessary that were still a knock on effect of changing the CSS attribute parsing in 1.6.3 to also return arrays for things like a comma-separated list of font families. This also caused the ARGB issue since there were also commas. 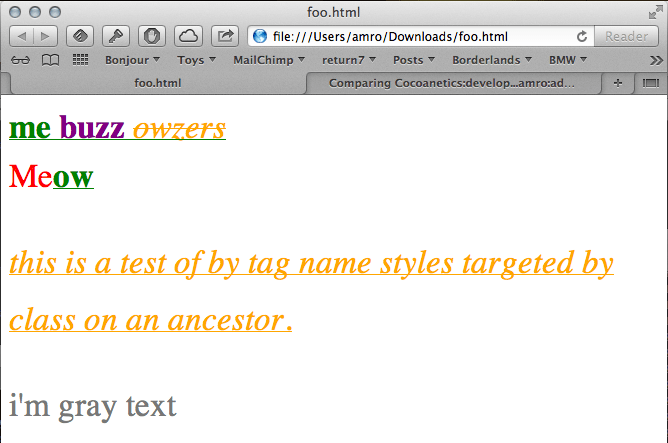 While fixing this – again – Amro Mousa made the CSS cascading even more general. Here’s a comparison of cascaded CSS attributes between Safari and DTCoreText. I needed to update the documentation to – finally! – include enums as AppleDoc supports them now. Since this couldn’t deal with the previous way I defined them I also changed them to be using Apple’s NS_ENUM macro to give them an underlying type. This adds a new section in the documentation for the enums as well. And while I was at it I also added a programming guide document where I plan to add common programming examples when I need to explain something. I added the smoke test example from the setup guide and also added information about pre-loading the font override table to speed up the first layout of DTCoreText considerably.